In 1959, Leonard Good saved the Western World. Nikita Krushchev had come to America and, while touring through Iowa, participated in a parade through Des Moines. The crowd along the route was silent as the Communist leader passed by; some held placards that read “We butcher hogs, not people.” Krushchev held his hand up and wiggled his fingers at them. Good, a college student at Drake University at the time, noticed the icy reception the Midwestern crowd was giving the visitor and thought it was no way to treat a guest. As Krushchev, seated in a light blue Cadillac convertible, passed near him, Good began to wave and blow kisses to the Russian leader. Krushchev saw him and turned to the young American and waved back. As the convertible rolled on past him, the Russian leader continued waving to him, standing up and turning around backwards to offer a thankful response to this single, enthusiastic crowd member. Good jokes that perhaps that moment of mutual acknowledgement served to temper any aggressive U. S. sentiments that Krushchev may have harbored. What we do know is that nobody got blown up in the ensuing years. Good, however, has gone on to blow up many things in his career as an outside-the-box science teacher. What he hasn’t blown up, he’s sent flying high into the air, shot it through with electric current, dissolved it, submerged it in various solutions, burned it, frozen it, built it, broken it or simply used it in countless different experiments and demonstrations. Students love to see Mr. Good walk into class; even better, they love to visit him at his shop tucked away deep in the woods. 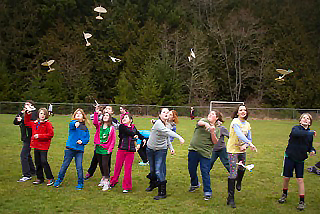 “I want to see something blow up,” said a young lass during a recent science class Good delivered to the fifth-grade students of John LaVassar at South Whidbey Elementary school. “He says some stuff I sometimes kind of get,” said another student when asked what he liked about Good’s classes. The kids love it. Soon they’re all outside, tossing their gliders everywhere, testing out one of Daniel Bernoulli’s theories of fluid mechanics, which Good had explained to them using a vacuum cleaner and a styrofoam ball. Before long, a few of them are bringing damaged gliders back to Good who patiently fixes each one from a little tube of that super glue. 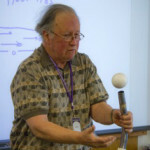 Although this day’s lesson had to do mostly with physics, Good says he likes to begin teaching science to new students by introducing them to chemistry. “It’s the queen of them all—the focus of all the sciences,” he said. Ergo—explosions. What happens when you drop a little chunk of sodium metal into a container of water? 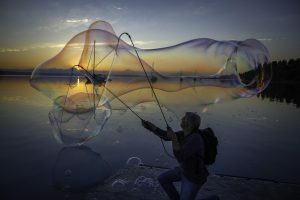 “It produces an explosive reaction that is quite satisfying,” said Good. Good’s own interest in science was sparked, in part, by annual spring trips with his father to the open house of Oklahoma University’s Engineering Department. There he was always fascinated by one demonstration in particular. A conveyor belt carried ball bearings along to its end where they dropped onto a piece of polished steel. They would bounce high into the air from there onto another polished steel landing, then to another and another, until they would finally fall into a funnel-shaped collector that would deposit them back onto the conveyor belt where they would start their journey anew. Good’s parents were both accomplished, award-winning artists, not scientists. His father became the head of the Art Department at Drake University, where Good encountered Krushchev. The following year, he experienced an even more personally momentous encounter at Drake. He met his future wife, Linda, in the summer of 1960. He gave her a ride back to her Seattle home at the end of the summer. She rode all the way on the back of his German-made Zunndapp motorcycle. They slept under picnic tables and visited Yellowstone before heading north across the border into Canada. At the Kootenay River, the ferry couldn’t carry them across because of a flood. Good looked up and noticed a railroad bridge crossing high above them; they crossed the river on it, bumping along the cross ties between the rails. That trip was the first in a lifetime of adventures together. They married in 1962. In 1968 they moved to Whidbey Island from Hawaii, looking for cheap land where they could settle down. Linda was related to the Metcalf family, a well-established island clan, and had spent many happy hours exploring the beaches and forests here as a child. They bought 10 acres with a house and some outbuildings for $11,000. Soon afterwards, Good landed his first job teaching science at the Evergreen School in Seattle. “It was an alternative school. There was no curriculum. No book. It was great,” he said. Russell Clepper is a singer-songwriter who plies his trade locally and around the country. He is also a substitute teacher for the Oak Harbor School District. Clepper would like to acknowledge Ro Purser for alerting him to the story about Krushchev and Good. CLICK HERE to read more entertaining and informative WLM stories and blogs. WLM stories and blogs are copyrighted and all rights are reserved. Linking is permitted. To request permission to use or reprint content from this site, email info@whidbeylifemagazine.org. Well done. Russell. We’ve known Linda and Leonard for decades and heard versions of these stories. But you really captured a lot in this interview. Great piece on local hero Professor Good, Russell!!! Delightful piece on a most cherished and delightful man. Thanks much for writing, publishing, disseminating! We need more “Professor Good” people in the world! Teaching at its best! I too have fond memories of Leonard and Linda, from the 70s when I was a teen. They lived through the woods from my mother. They both foster passion and inquisitiveness in all, young and old. Our children are lucky to have them to learn from. 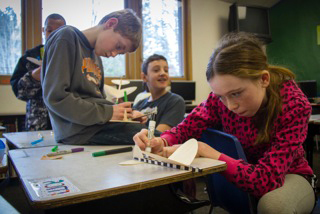 As an aside, although not mentioned in the article, the opportunity to bring Leonard into John LaVasser’s classroom was funded in part by a grant from the South Whidbey Schools Foundation, which provides approximately $20,000 a year in innovative teaching grants. 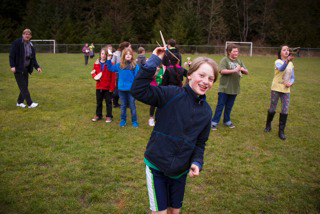 For more information about the Foundation, please visit http://www.southwhidbeyschoolsfoundation.org. 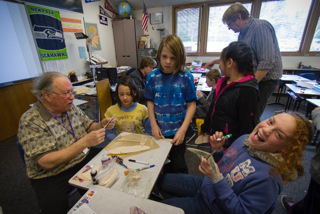 I’m glad you mentioned the grant from the South Whidbey Schools Foundation. Mr. LaVassar told me about that and I had planned to put it in the article originally, but limited space is the cruelest editor. Maybe we can publish something about their activities in some future article in WLM. I’m sure some of those innovative teaching techniques apply to the arts. Thanks Russ and Dave ! and to everyone at Whidbey Life Magazine! What a great story! I met Leonard and Linda when I moved to Whidbey in 1981. We had so much fun: parading in the Fourth of July parade, playing in music groups, exploring the island, and bartering German/guitar lessons with Linda. There home was always open to me. They are both wonderful teachers and have infectious smiles whenever you see them, no matter what situation. One of the best stories I’ve ever heard was Leonard’s boat trailer story.